The use of regional climate models (RCMs) is a fundamental tool to investigate the local impacts of climate change. While global climate models are useful to understand global climate patterns and trends, they are of limited value to inform policy at a scale that is relevant for policymakers and stake-holders. 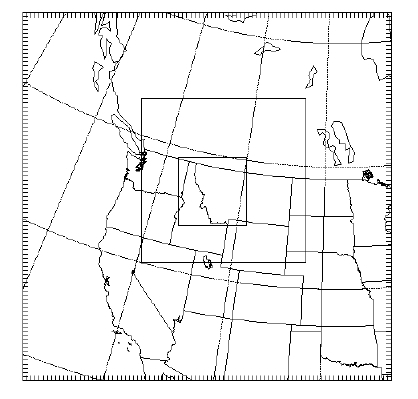 WRF simulation setup for Western Montana with 3 nested domains. Our lab uses the Weather Research and Forecasting (WRF) model to downscale the Global Forecasting System (GFS) reanalysis and the business as usual Parallel Climate Model (PCM) over western Montana to a 4Km spatial resolution and hourly temporal resolution. This information is used to run a ecohydrologic model (Ech2o) over selected watersheds to investigate the impacts of climate change on the water resources of our region. 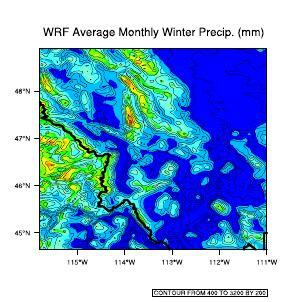 Distribution of average monthly precipitation for the winter months (November through February) over Western Montana as calculated by GFS-WRF. A main research question in our lab is the how well we know the spatial distribution of winter precipitaiton and of the snowpack in complex terrain and how the uncertainty involved in the estimate affects our understanding of the hydorlogic cycle. This is an important quetions because there is emerging evidence that we may be systematically underestimating the amount of water contained in the snowpack at high elevations. We use our ecohydrologic model (Ech2o) among other models, to study the sensitivity of the spatial patterns of above ground primary production, soil moisture and soil temperature to changes in the atmospheric conditions and to land use change. Since the hydrologic network provides a template for the spatial distribution of vegetation at the landscape scale, we should expect that any alteration in the water flows will have an expression in the structure of vegetation. Simulated leaf area index and soil temperature in a mountain watershed. Water management and economic policies can affect the redistribution of water resources in the landscape with potential negative effects on other users. These side effects alter the environmental constrains and the availability of resources necessary to perform the economic activities. In collaboration with UCDavis and the Brazilian Agricultural Research Council (EMBRAPA), we have interfaced cutting-edge hydrologic and economic models to produce a hydro-economic framework able to simulate the effect of water policies or environmental scenarios on the economic behavior of farmers to investigate optimal resource allocation and maximization of net revenues in poor rural areas in Brazil. More recently we have started an effort to assemble together a eco-hydrologic model (Ech2o) with a wildlife dynamics model (HexSim) in an economic optimization framework to investigate optimal forest and wildlife management under different climate scenarios. Experimental work in the headwaters of Lost Horse Canyon in the Bitterroot Valley, south of Missoula is being carried out investigating small scale energy and water transfers under the snowpack in semi-alpine environments. This includes soil-vegetation-atmosphere transfers at the plot scale and diel variations of snowmelt driven stream flow fluctuations.